Yesterday was wild fun. My afternoon started with Las Meninas, a film that hails from Ukraine and, more specifically, from the mind of painter Igor Podolchak and cinematographer Svetlana Makarenko. It's a disturbing poem that communicates a world of immense claustrophobia, darkness, anxiety, and hyper-aurality inspired, it seems, by both Andrei Tarkovsky's Mirror and 18th-century still-life painting. While I can't speak much on behalf of the latter--except for the film's fascination with food on plates, grapes and other fruit in bowls, table-settings and especially silverware, clothing, fabrics, and the stylized lounging of women--I can comment on a few of the ways this film evokes Tarkovsky's vision in Mirror. For one, Las Meninas takes in interest in how sound and images constitute one another. The sound of a fork scratching a plate is pushed to unbearable heights; voices and words layer and repeat; falling sugar cubes hit the ground with the sound of shattering glass; the sounds of opening a cabinet or closing a door are just amiss from their corresponding visual component. Through such an active and unpredictable auditory world, Podolchak not only gives us the chance to examine the relationship between sound and image but also meditates on the idea of silence and how it breaks. This film also moves like Mirror in its constant linking of ideas and people through very physical substances and elements--water, urine, hair, metals, grapes--and more abstract threads--words, camera angles, colors. Further, these people live in a house of mirrors, windows, and other framing devices. They are perpetually not only themselves, but their reflection, the reflection of their reflections, reflections of objects in the house, and of each other. The most enjoyable part of this film for me was the commitment of the camera to interact with these mirror images in ever more clever ways. For about 10 minutes, all of the action takes place in a mirror on a far wall. We see people move in and out of this frame but the large and luxurious room around it remains inanimate. After a time, we begin to see only this mirror; even though it is reduced to about 1/16th of the "real" cinema screen, it holds the moving images and so we start to conceive of it as the movie. We fall into this illusion of these mirror images so deeply that it's a bit startling when the outer world of the "real life" room begins to interact with the mirror/mini-cinema screen. These moments (of which there are many) when the house of mirrors, or the clever drift or zoom of the camera, or a play with light and darkness create insightful illusions are spectacular, but the film never reaches the dramatic heights and beauty that make something like Mirror so utterly mind-blowing (see video below). But, I realize that's like saying this review doesn't quite hit the mark André Bazin, or Pauline Kael, or J. Hoberman would have. 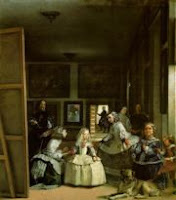 My only real complaint with Las Meninas was its rather grotesque treatment of the female body. The film renders all sexuality rather disgusting, a choice which adds to the effective and well-crafted discomfort of a lot of this film, but the men seem to at least be in charge of their grotesque behavior whereas the women are subject to A TON of skirt lifting and physical violation by male figures, including a difficult-to-stomach fetishization of the straps and girdles that keep them all locked up. Not to mention that many of the (crotch) shots put the viewer in a voyeuristic position, leaving me feeling not a little violated. One woman leaving the theater exclaimed, "I just kept crossing my legs!" So that's something to think about when watching this movie. But yes, go see this movie! And most especially do so if you're willing to abandon any taste for narrative in order to check out how Tarkovsky's ideas live on through Podolchak, Makarchak, and contemporary Ukrainian cinema.